A pint-sized performing pony stolen from his enclosure at an Italian horse fair has been recovered. Charlie has been reunited with his owner, Bartolo Messina, who was distraught over fears that his pony – promoted as the smallest horse in the world – may have been stolen as part of a kidnapping plot. Italian media reported that Charlie was found on Thursday in a secluded area near Lake Garda, 340km north of where he was taken. Charlie performs for his fans. Charlie, who is 63cm (24.8in) tall, disappeared last week from his enclosure at the 47th annual National Horse Fair in Città di Castello, in the country’s Umbria region. The thieves cut a hole in the wire fence around his enclosure, carrying the pony off through a field of tobacco plants. 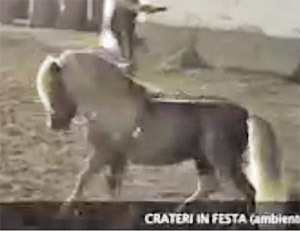 The president of the national horse show, Angelo Capecci, told a local newspaper, the Corriere Dell’Umbria: “We have been victims of a serious criminal act that offends and humiliates the equine world. “The security measures that for years have ensured the safety of the participants and that have always prevented the occurrence of similar incidents, were apparently undermined by a shameful act that does not reflect the horse world and its values. Media reported police suspicions that Charlie was taken by Italian criminals. While Charlie is undoubtedly one of the world’s smallest horses, the Guinness World Records lists the smallest living horse as Thumbelina, a miniature mare in the United States who stands 17.5 inches tall.